I love stories that involve magic and magical creatures, especially if they are about women stepping into their power, and into a reality where ultimately love makes everything better. In my mind the world is much stranger than we think. As our understanding of the world has grown, mostly through science and exploration, what we believe is real has changed radically over the centuries. In my “Touchstone of Love” novella I play with time travel and magic, and the power of the land. According to the laws of today’s physics, time travel is not forbidden, just not at all understood, testable, or observed. Yet theoretically we could time travel. How cool is that? I like to explore what my heroine’s life would be like if she were thrown back into thirteenth century France, and confronted with the daily life, and magic. In my stories, I also play with magic. And just like in our world, with electricity, magic is not entirely understood but can be manipulated. I like playing with the unintended consequences of magic and the “what ifs” that arise with my characters meddle, often unconsciously, with magic. 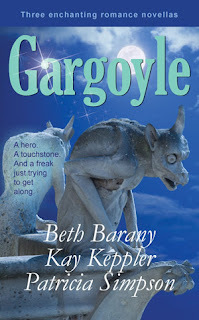 In my novella, “Touchstone of Love” in the collection Gargoyle: Three Enchanting Romance Novellas, I’m also hinting at the power of magic that is steeped in stone and in the earth. I’m borrowing from ancient wisdoms, mostly lost in the mists of time, of the earth’s ley lines and power centers. My story centers on the building of a cathedral in a town north of Paris. I believe that all cathedrals in France were built upon ancient, probably goddess worship or druid power centers. Having visited many such sites in France, I’ve felt the power of the stone and the land. The research I’ve done, especially for Notre Dame of Paris has hinted at the fact that it was a center of annual druid ritual. For me, the paranormal is what is outside the accepted realms of “normal,” difficult to explain or rationalize, yet real, felt, and experienced. In some of my stories, like in Henrietta The Dragon Slayer, a young adult epic fantasy, magic is a part of that world, manipulated by adepts, though hardly understood by the common people, and even sometimes feared or banned. In my romance, magic may not be a part of the world, but is manipulated and used by a hidden few. I like the mystery of magic, and playing with the rules of magic. My modern-day heroine in “Touchstone of Love” must use magic even though she doesn’t understand it. What would you do if you could use magic? Or, better yet, were magic? I’ll be giving away one e-book (international) or print copy (US only) of Gargoyle: Three Enchanting Romance Novellas and a $10 Amazon gift card to those who comment below about what you would do if you were magic. Lynda will pick a winner in a week. The mysterious lives of gargoyles. They don’t just hang out on buildings. They right wrongs. They wreak havoc. And they change the lives of unsuspecting people who never see them coming. Craig knows that Bea is in trouble. But Craig can’t do anything about it—because he’s a garden gargoyle and Bea can’t hear his warnings. When unexpected visitors arrive to help, Craig finds the power he had all along. Now the neighborhood will never be the same. Sentenced to burn at the stake for sorcery, Merofled volunteers to help jaded warrior Alaric kill a gargoyle that threatens her village. But Merofled soon discovers the gargoyle is not a monster at all. It’s a misfit just like her. Can she persuade Alaric to spare the gargoyle–and herself? Julien of Beauvais stomped through the edge of town, through the fields and the stormy dark. He didn’t care about the wet and wind. He needed to find peace, he needed to find inspiration. It was time that he showed Master Stonemason Bernard de Chantilly all of his skill and artistry and present his master work to the community and get his approval, even if the master stonemason said Julien could not present his work at Michaelmas in five days. The master stonemason didn’t like him and had not allowed him to present the previous year. But this year would be his. It was time he showed Master Bernard that he was ready to become a master mason and travel as a free man. His training was complete. He’d become a journeyman and done a short trip to Paris with Master Bernard a few years ago. Yet, most men at his age of twenty-six years had already started their own houses and were busy at work on the new cathedrals sprouting all over France. He wanted to travel to Amiens, or Rennes, and direct his own house, with a woman at his side, and his own apprentices, and a passel of children. The time was now. His time. Oblivious to the cold and the wet, Julien stomped through the field in anger. Not only was Master Stonemason Bernard a barrier to his dreams, but so was also Marie-Jeanne, his intended. She’d betrayed him with that farm boy from the count’s household. How was he going to create a home when his betrothed was ready to run off with another? That was why, in his anger, he’d messed up the day’s stone carving work and had been relegated to sorting and breaking granite blocks for the other apprentices. The rain pelted his face as Julien stumbled over something. He lost his footing and slipped to his knees. He put out his hands to brace himself and felt something soft. Soft and warm. As gently as he could, as if he were handling a new-born lamb back at his parents’ farm, he felt for the shape of the soft and warm, and unmistakably touched a breast. A woman fallen in the fields. In the cloudy night with no light of the moon or stars, he reached out to learn more about her. She was alive by the warmth of her, and by the strong pulse at her throat, and not long outdoors, as her skin wasn’t completely chilled. He couldn’t leave her, so he scooped up her unconscious, naked form and headed for his workshop hidden in a copse of chestnut trees outside the walls of the town. Once inside his small workshop, he stoked the fire under the cook pot. He rushed to cover her with his blanket and rubbed the hands and feet of the woman, something he’d seen the old midwife do to women who sometimes fainted in the fields. The woman breathed deeply, but remained asleep. She was naked, curved in all the right places. Clearly well fed, luscious, but quite improperly dressed for a fall night, as if she’d been bathing and wandered off from her task. Maybe she was under some spell that made her sleep. While he was a god-fearing man, and worshipped Mother Mary, he knew magic was in the land. He felt it when he worked the stone every day, but never talked about it. The woman appeared calm, even peaceful as she slept. Definitely a woman, not a girl. Her long golden locks had come loose from her tie. She had rosy cheeks, pink lips, an angular nose, and a long column of a throat. Her chest rose and fell with even breaths. What color were her eyes? He pulled the wool blanket up under her chin, and tucked it around her body to keep her warm. A tiny waist, a warm shapely rump, long legs, strong feet—he noticed all that as he chastely tucked the blanket around her. He’d noticed that her palms were strong, with callused, long fingers, almost as big as his. She must be a farmhand from a neighboring village, but he didn’t recognize her. She was almost angelic in how she slept. His troubles forgotten, he made for his worktable on the other side of the one-room shed and picked up his chisel. He’d found the inspiration he needed to start his work of art. Award-winning author, Beth Barany has been making up fantasy and adventure stories all her life. She writes magical tales of romance and adventure for women and girls to transport them to new worlds where anything is possible. 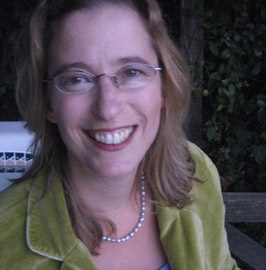 To learn more about Beth and her fiction, and sign up for her newsletter, visit her site: author.bethbarany.com.